The US Dollar moved sharply lower against the Swiss Franc, issuing the largest decline in two months. 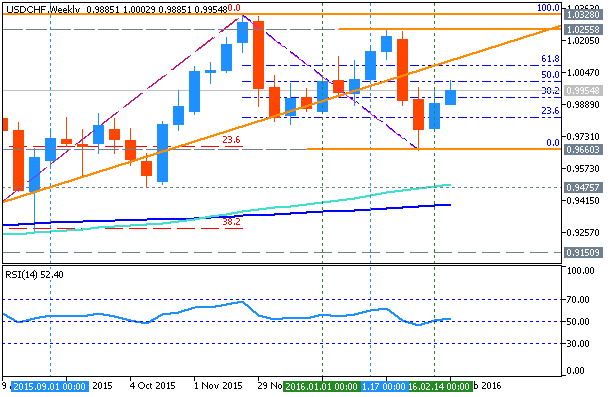 A daily close below trend line support at 0.9769 exposes the 23.6% Fibonacci retracement at 0.9695. 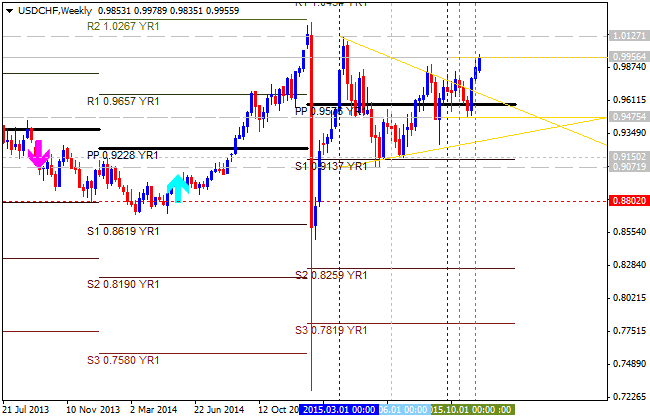 Alternatively, a move above the 14.6% Fib at 0.9859 opens the door for a test of the March 12 high at 1.0251. Prices are wedged too closely between near-term support and resistance levels to justify taking a trade on a long or short side from a risk/reward perspective. With that in mind, we will continue to stand aside until a more attractive opportunity presents itself. The US Dollar found interim support against the Swiss Franc after issuing the largest daily decline in two months. Near-term resistance is at 0.9890, the 14.6% Fibonacci expansion, with a break above that on a daily closing basis exposing the 1.0055-126 area (23.6% level, March 12 high). Alternatively, a push below trend line support at 0.9794 clears the way for a challenge of the 23.6% Fib retracement at 1.0251. The available trading range is too narrow to justify entering a trade on the long or short side from a risk/reward perspective. With that in mind, we will remain flat for now, waiting for price action to offer a more compelling opportunity down the road. 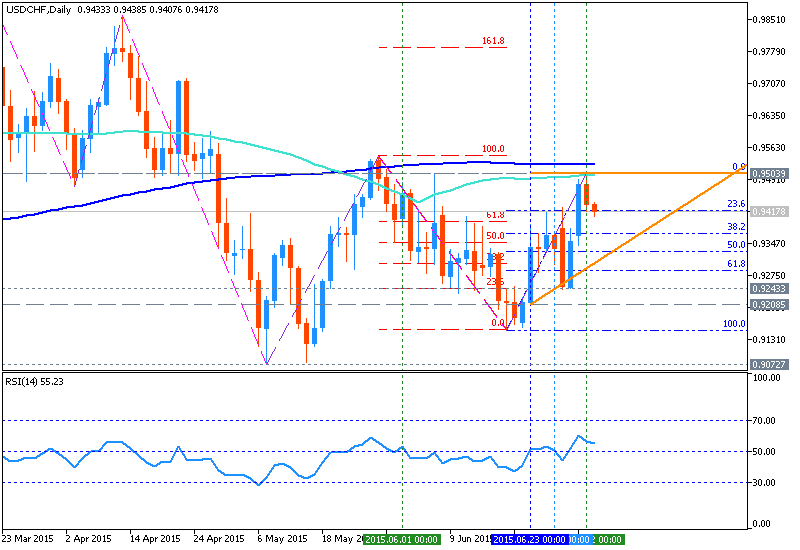 The US Dollar is attempting to launch a recovery after finding support below the 0.95 figure against the Swiss Franc. Near-term resistance is at 0.9746, the 14.6% Fibonacciexpansion, with a break above that on a daily closing basis exposing the 23.6% level at 0.9910. Alternatively, a reversal below the 38.2% Fib retracementat 0.9428clears the way for a challenge of the 50% threshold at 0.9213. Positioning is inconclusive at this point, with prices offering no clear-cut and actionable signal to initiate a long or short trade. We will continue to remain on the sidelines for the time being, waiting for a compelling opportunity to present itself. The US Dollar looks poised to continue higher after clearing range resistance below the 0.98 figure against the Swiss Franc. A daily close above the 23.6% Fibonacci expansion at 0.9910 exposes the 1.0126-77 area (March 12 high, 38.2% level). Alternatively, a turn back below the 14.6% expansion at 0.9746opens the door for a test of the 0.9428-79 zone (38.2% Fib retracement, April 3 low). Entering long is tempting from a purely technical perspective. However, we will opt to pass on the setup. The SNB’s erratic approach to monetary policy of late warns of outsized underlying volatility risk in holding CHF exposure. With that in mind, we will stand aside and look for opportunities elsewhere. 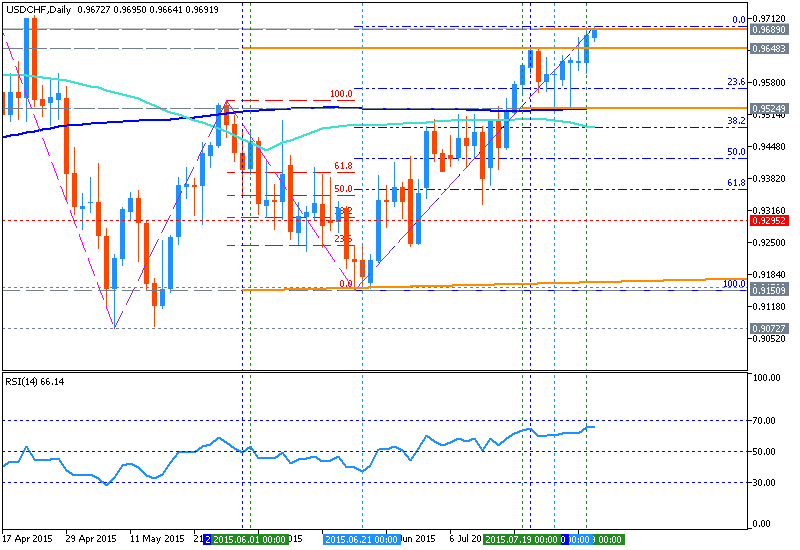 The US Dollar continued to push higher against the Swiss Franc, with buyers now taking aim at late May swing highs. A daily close above the 0.9551-54 area (23.6% Fibonacci expansion, trend line) exposes the 38.2% level at 0.9769. Alternatively, a turn below trend line support at 0.9179 clears the way for a test of the May 7 low at 0.9071. Prices are too close to resistance to justify entering long from a risk/reward perspective. On the other hand, the absence of a defined bearish reversal signal suggests that taking up the short side is premature. With that in mind, we will remain flat for now. The US Dollar resumed its move higher against the Swiss Franc, issuing the strongest daily close in three months. Near-term resistance is at 0.9712, the 38.2% Fibonacci expansion, with a break above that on a daily closing basis exposing the 50% level at 0.9770. 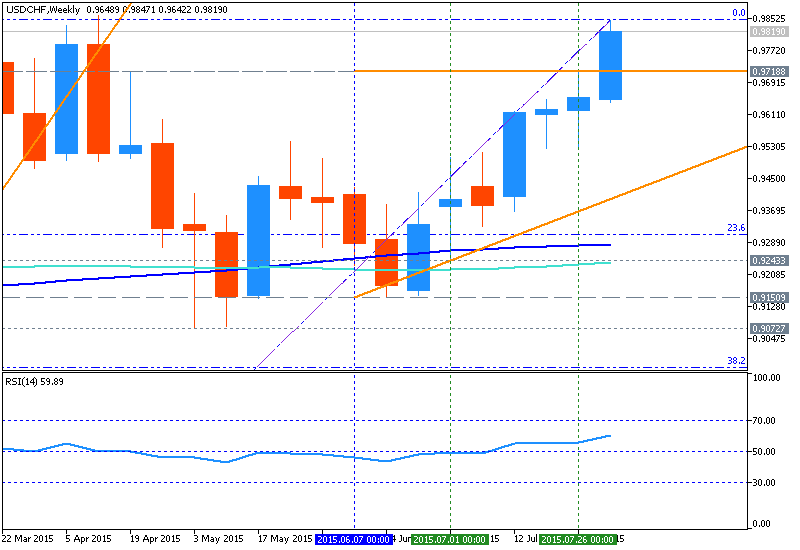 Alternatively, a move back below the 23.6% Fib at 0.9641 opens the door for a challenge of trend line support at 0.9572. The available trading range is too narrow to justify entering a trade in line with our long-term Euro outlook from a risk/reward perspective. With that in mind, we will remain flat for now, waiting for price action to offer a more compelling opportunity down the road. The US Dollar continues to grind upward against the Swiss Franc, with prices narrowly establishing a foothold above the 0.98 figure. A daily close above the 61.8% Fibonacci expansionat 0.9829 exposes the 76.4% level at 0.9900. Alternatively, a move back below the 50% Fib at 0.9770 clears the way for a test of the 38.2% expansion at 0.9712. W1 price is located above 200 period SMA and 100 period SMA for the primary bullish with secondary ranging between Fibo support level at 0.9660 and Fibo resistance level at 1.0328. The price is breaking 50.0% Fibo resistance level at 0.9997 to above with the bullish triangle pattern was formed for the ascending trend to be continuing. If the price will break Fibo support level at 0.9660 so the reversal of the price movement from the primary bullish to the primary bearish market condition will be started. If the price will break Fibo resistance level at 1.0328 from below to above so the primary bullish trend will be continuing with good possible breakout of the price movement. USD/CHF: bearish breakdown. 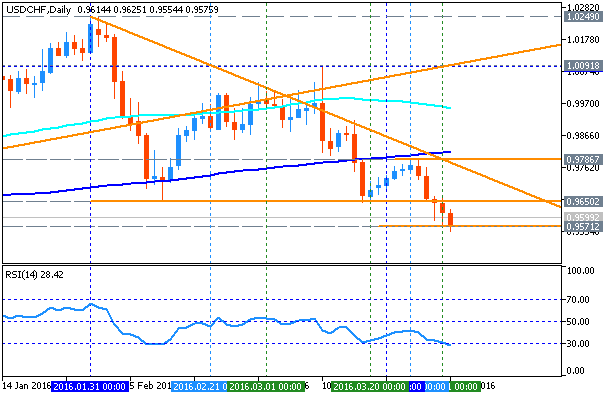 Daily price is on bearish breakdown with 0.9571 key support level and descending triangle pattern to be broken to below. if not so the price will be moved within the channel.